We love dance parties, so I said absolutely when I was given the chance to review "Count Me In!" 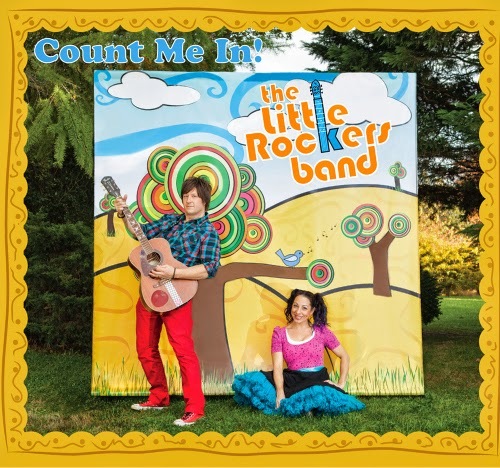 - the latest album release from The Little Rockers Band. This new album will hit shelves tomorrow, and I think there will be a whole lot of dance parties going on when it does! 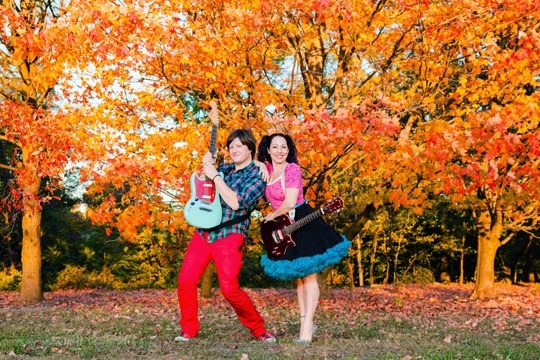 The Little Rockers Band features Chris & Jessie Apple, who bring a little bit of rock and roll and a little bit of Broadway to the mix. They encounter kids on a constant basis as they teach music. All of the songs featured on this new album were inspired by experiences with those kids - how cool is that? I teach a successful little garage drama troupe and dream of having a performing arts space someday....I'm inspired by all that Chris & Jessie have accomplished! There's really a little bit of everything on this album - from Motown to '50s Rocker Style to a Paul Simon cover, kids will be introduced to a wide variety of music styles, without even realizing that they are learning about music. They'll be having too much fun singing and dancing along! I'm particularly fond of "Hi, Hi, Hi" because it has such a grooving Motown spirit, "In The Bathtub" because I sing while my kids are in the bath all the time and I need new material, and "Fortune Cookie" because it's just peppy and fun. Lincoln and Addie are both happy to dance along to any tune, and Lincoln's starting to pick up some of the words to these songs! This album is currently playing on repeat in our family van, and will probably stay there for a long time. Hop over to The Little Rockers Band's website, where you can read all about their music. You can also follow along on Facebook and Twitter! One Director Jewels reader will win a copy of "Count Me In!" on CD! This giveaway will end on April 28 at 11:59pm CST. This giveaway is open to US readers only. Winner will be emailed and will have 48 hours to respond or prize will be forfeited. Their live set is equal parts rock concert and musical theater. I learned that they do family rock shows, music classes and school assemblies – and concerts for kids. I like the music classes! I learned that they provide music classes! They have classes and shows. I learned that they compose and produce all of the class music and curriculum together with songwriting input from Jessie’s mom, singer/songwriter Nancy Hartline, and their best friend and fellow Teaching Artist Liam Moroney. kristiedonelson(at)gmail(dot)com Thank you! They offer fresh ways to introduce kids to fun and high energy music. I leaned that they tour and do music classes and that they also do lots of kids events. i learned that they believe in everyone's music ability, no matter how old they are.